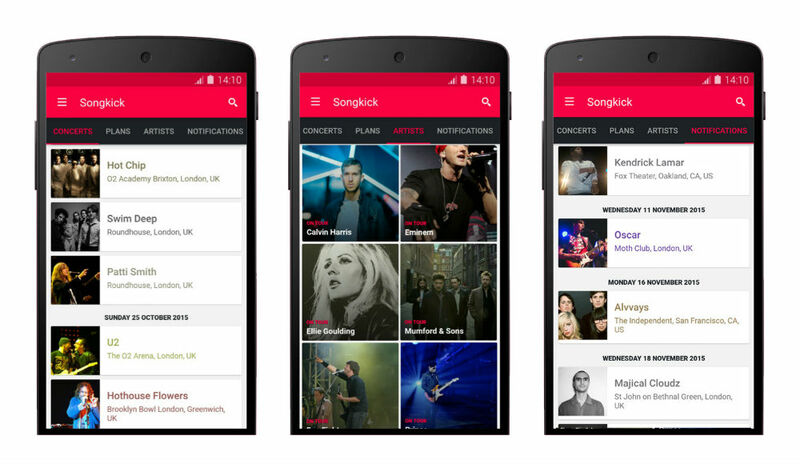 Songkick, an app all about concerts in your area, received a major update this week on Google Play, bringing with it an updated Material Design look, Spotify music importing, and the ability for in-app concert ticket purchasing. With the redesign, users will have a more fluid experience, complete with sliding columns, pull out drawer, and color matching notification area. To do this, the developers of the app rebuilt Songkick from the ground up, allowing for more stable performance. For those who use Spotify, the importing of your favorite songs and artists can be done in mere seconds, allowing Songick to identify concerts in your area that will be of interest to you. The same can be done with Google Play Music, Facebook, and your on-device music library. Lastly, and possibly the most important piece of the update, is not only the ability to locate and discover concerts in your area, but to purchase tickets for them while you are mobile. While you won’t find every venue and concert available, Songkick states that they are working to bring more events to the service for ticket purchasing. In a city like London, we now sell tickets directly for a third of all upcoming concerts – meaning that you have access to over 1000 events in just a few taps of the app, and our ticket coverage throughout the UK and US continues to grow exponentially. The update is now live on Google Play, so go check it out.